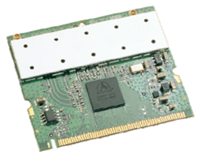 SparkLAN WMIA-198ANH is a high-speed 802.11an High-Power 5GHz Mini PCI module with Atheros AR9220 chipset, which delivers up to 300Mbps data rate. Its superior RF performance helps extending wireless range and coverage to farther distance. Operating in the 5GHz band, the less crowded frequency band, WMIA-198ANH greatly reduces the chances of interference. WMIA-198ANH features advanced WEP encryption, WPA, WPA2, Encryption TKIP/ AES, and 802.1X to help protect data over wireless communication without sacrificing the performance. SparkLAN WMIA-198ANH is the affordable and ideal choice for you to quickly and easily integrate with your wireless enabled applications.